The past two weeks here in Japan my kids have asked a lot about peace, atom bombs, and WWII. August 6th marked the 68th anniversary of the atom bombing of Hiroshima. Three days later another bomb was dropped on Nagasaki. August 13-15th are the Obon holidays, when we celebrate the lives of the dead including the victims of these bombings and people bring folded paper cranes to the Sadako statue in the Hiroshima Peace Park. I was lucky to find a picture book version of Sadako and the Thousand Paper Cranes, which I read in school. Ed Young illustrated the book Tsunami, which also deals with a horribly tragic event, and so I was hopeful that this picture book would be done with the same grace. It was. The story of a girl dying of leukemia as the after-effect of a nuclear bomb dropper on her city when she was a toddler is a hard one to adapt for a young audience. Twenty years before, Eleanor Coerr had success with a longer version of this book for older children, and was able to keep the same lyrical quality and respect for life in this version. It is Ed Young's illustrations that give this an extra special quality, however. The illustrations use light to represent hope and dark to highlight the horror of the A-Bomb dome and the tragedy it represents. The dreamlike quality of the background illustrations don't continue to Sadako's face, which is drawn to show what determination she had in face of the ultimate adversity. This is a wonderful story of hope and friendship and the importance of peace, as well as an excellent introduction to the history of the only atom bombings A(and let's keep it that way) and to post-war Japanese society. We have been folding cranes for my mother-in-law as the superstition is that one thousand of these will bring one thousand years of happiness. When there is nothing to do to help someone you love, folding paper cranes gives you a goal. Here's a paper crane tutorial if you decide to see just how much work Sadako put into her goal. This post is for Nonfiction Monday, hosted by me this week at Perogies & Gyoza. 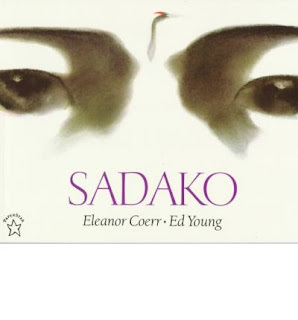 I remember reading Sadako years ago, and it still circulates well. This week I reviewed Driven: A Photobiography of Henry Ford. Thanks for hosting. I love this idea and have often featured Nonfiction Books on my blog. I'll have to remember to write about them on Mondays and join the fun. Just discovered your lovely blog with mention of several books that sound interesting. I'll be back seeking ideas for other great nonfiction books!